Following a strong showing in the qualifying matches at this month’s St. Louis Regional FRC competition, the School’s robotics team, Optimus Prin, was chosen for a three-team alliance that captured third place. In all, 48 robots competed in the tournament, which was titled “Destination: Deep Space” in honor of the 50th anniversary of landing on the Moon. The four members of Principia’s “build” team—senior Sam Ferrell, junior Mitchell Gordon, sophomore Gavin McFall, and freshman Elliott Day—stayed busy on the field and in the pit. During the 10 qualifying matches, Sam and Mitchell drove the robot down the field, collecting balls in the basket and lifting them into the cargo hold or rocket. Gavin was the human player delivering the cargo balls and hatches during the games, and Elliott documented the games on video. Between matches, all four worked in the pit to tweak and repair Ratchet (the robot) as needed. Sam, in particular, became a master of defense, preventing opposing robots from scoring. Other teams took note of this, leading to Principia’s selection as part of the alliance that claimed third place in the final championship. Principia also drew the attention of the judges, who “were impressed with the technical knowledge, design, and mechanical skills that each of the four team members used to build their robot,” says Kathy Foy, one of the team’s two coaches. The judges took special interest in a CAD video Elliott had created, which allowed the team to achieve a sophisticated level of design before building Ratchet. Next, the Optimus Prin team, which is sponsored by Principia and Boeing, hopes to advance to the Missouri State Championship in May. 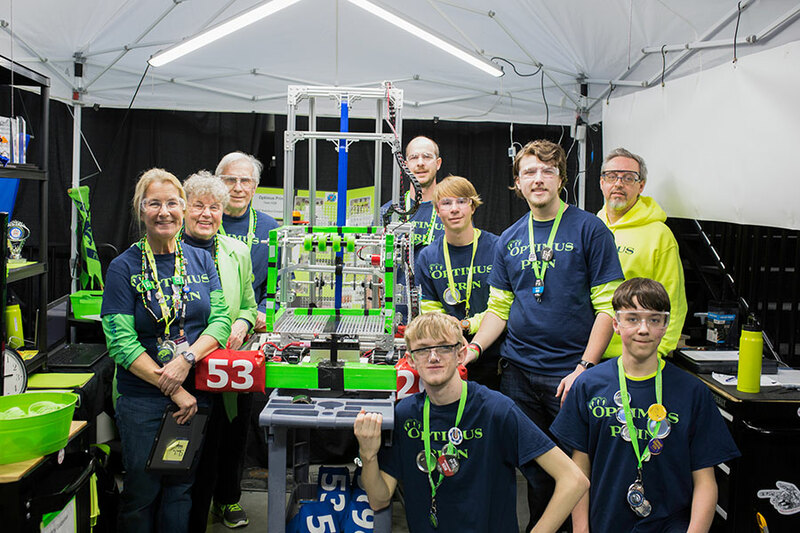 “We are grateful for all of the hard work and dedication that our robotics students put forth to design and build a very competitive robot,” says Sheila Hobson, the team’s other coach. Foy adds, “We would like to thank our mentors Bob Foy, Ryan Day, and Chris Gordon for their many hours in helping us build a competitive robot.” The entire team extends additional thanks to Chris Gordon, an engineer at Boeing, who served as their coach on the field.